Rogers: While China and Russia continue to challenge the United States in space, the Air Force appears to be more interested in fighting Congress rather than dealing with the enemy. WASHINGTON — The chairman and ranking member of the House Armed Services Committee’s strategic forces subcommittee ripped U.S. Air Force leaders for not taking threats in space seriously and for their continued resistance to reform. Speaking on Wednesday at the Center for Strategic and International Studies, Rep. Mike Rogers and the subcommittee’s top Democrat Rep. Jim Cooper presented a united front, criticizing the Air Force for stalling legislative changes that Congress passed last year to reorganize military space programs and accelerate the development of next-generation technologies. While China and Russia continue to challenge the United States in space, the Air Force appears to be more interested in fighting Congress rather than dealing with the enemy, Rogers said. Both Rogers and Cooper sounded angrier and more frustrated with the Air Force than they were even a few months ago when they inserted language in the 2018 National Defense Authorization Act to create a separate space corps within the Air Force. 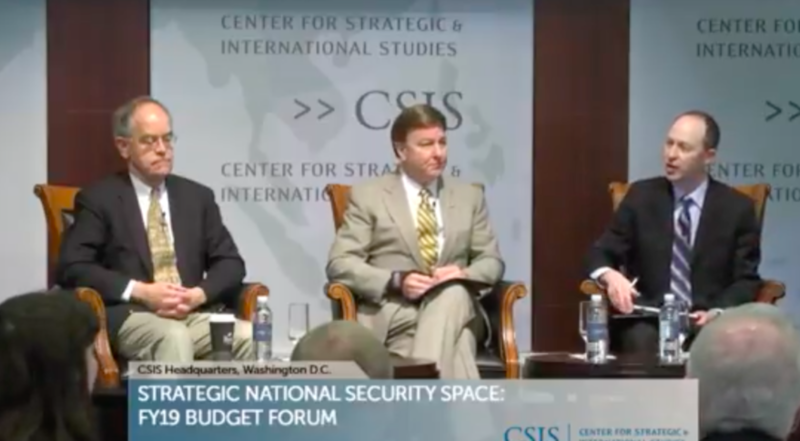 Rogers also was peeved that no Air Force officials showed to speak at the CSIS conference titled “Strategic National Security Space.” The event was billed as a high-level dialogue on military space and on the proposed budget for fiscal year 2019. “I’d like to see them here today to explain what they are going to do. They chose not to be here,” said Rogers. He noted that the Air Force has yet to communicate its plans to execute what the NDAA requires. “It’d be nice to know what they’re going to do,” he said. Conference organizers told SpaceNews that several Air Force and DoD officials were invited to speak but claimed they had scheduling conflicts. Cooper said space is a rare issue where a Republican and a Democrat are in complete agreement. “We are bipartisan. Still working on bicameralism.” The Senate did not spend enough time debating this topic and that is one reason why the space corps language was rejected. “Hopefully that will be corrected in the coming session,” said Cooper. Rogers estimated that organizing a space corps could take from three to five years. This problem “can’t be fixed within the Air Force the way it is structured now,” said Rogers. Cooper then went on to list a litany of examples of Air Force coming up short in space: Forty years of relying on a Russian rocket engine, technical jobs at the Space and Missile Systems Center have not been filled in decades, generals with space backgrounds don’t get promoted. Air Force officials in recent months have stepped up the rhetoric on space threats, announced reforms in acquisition programs and proposed a larger budget for space. They have argued that a space corps would be counterproductive because it would divide the Air Force, rather than integrate space into mainstream operations. The chief of the Air Force went as far as to tell airmen that they need to start thinking about space superiority the same way they think about air superiority. Rogers and Cooper both complimented Deputy Defense Secretary Patrick Shanahan, who was named the interim principal space adviser to the secretary of defense, a title previously held by the secretary of the Air Force.